Foggy Ridge Cider - Tradition, Reinvented. 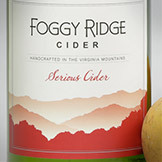 Foggy Ridge Cider began in 1997 with a cider apple orchard in the Virginia Blue Ridge Mountains. Founder Diane Flynt “grows ingredients”—bitter and acidic apples like Hewe’s Crab, Harrison, Tremlett’s Bitter, Ashmead’s Kernel and Dabinett, all full of complex flavor. For over a dozen years, the Foggy Ridge crew has crafted traditional cider apples into fine cider using all the skill and expertise of modern fermentation. 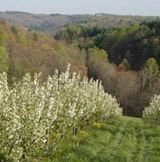 Foggy Ridge now grows cider apples for talented cidermakers throughout the region. "Great cider is made in the orchard," says Diane Flynt. Our little cider house has garnered big attention as a 2018 James Beard Award Finalist, one of five finalists for Outstanding Beverage Professional. While we released our last cider in Fall 2017, there are a few shops and restaurants still offering Foggy Ridge Cider. No hops or other flavor additions for us…instead, we aim to put the orchard in every bottle. Check our event page for orchard events and apple workshops in 2018!